Veterans for Peace works for the abolition of war, and while that process will take many steps, one that should be taken immediately is the dissolution of the North Atlantic Treaty Organization. NATO has always been a war-making institution lacking in accountability to the peoples of the nations it claims to represent. But NATO at least once claimed a defensive purpose that it neither claims nor represents any longer. NATO has militarized the nations of Europe against the will of their people, now maintains hundreds of nuclear weapons in non-nuclear European nations in blatant violation of the Nuclear Nonproliferation Treaty, and is threatening Russia with missile base construction on its borders. Having fought aggressive wars in Yugoslavia, Iraq, Afghanistan, and Libya, NATO remains in Afghanistan, illegally, immorally, and to no coherent purpose. The people of the United States, other NATO nations, and Afghanistan itself, overwhelmingly favor an end to NATO’s presence, while Presidents Obama and Karzai, against the will of their people, work to commit U.S. forces to at least 12.5 more years in Afghanistan. NATO provides the United States with a pretense of global coalition and legality. Approximately half of the world’s military spending is U.S., while adding the other NATO nations brings the total to three-quarters. The head of the Pentagon, Leon Panetta, recently testified in Congress that a war could be made legal by working through either the United Nations or NATO. While no written law supports that claim, it is a claim that has served its intended purpose. 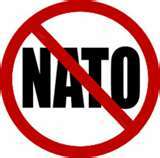 NATO also serves as a false legal shield, protecting the U.S. military from Congressional oversight. The U.S. dominated NATO holds up the past year’s war on Libya as a model for the future, with an eye on various potential victims, including Syria and Iran. In so doing, NATO serves as the armed enforcer of the exploitative agenda of the G-8, which has fled Chicago for the guarded compound at Camp David. NATO’s interests are neither democratically determined nor humanitarian in purpose. NATO does not bomb all nations guilty of humanitarian abuses. Nor does NATO’s bombing alleviate human suffering, it adds to it. Saudi Arabia is not a target. Bahrain is not a target. Ben Ali and Mubarak were not targets. An analysis of NATO’s real motivations reveals a desire to control the global flow of oil, to support dictators who have supported U.S./NATO wars, prisons and torture operations, to back Israel’s expansionist agenda, and to surround and threaten the nation of Iran. The killing and destruction engaged in by NATO in Libya was illegal, immoral, and counter-productive as is its aggression in Afghanistan. NATO’s wars have not brought democracy, peace, or human rights anywhere. Libya is not a model for future NATO action. There is no model for future NATO action. NATO has lost its reason to exist if it ever had one. Veterans For Peace joins with our brothers and sisters in Europe, who are also rallying nonviolently against NATO, in calling for its elimination.